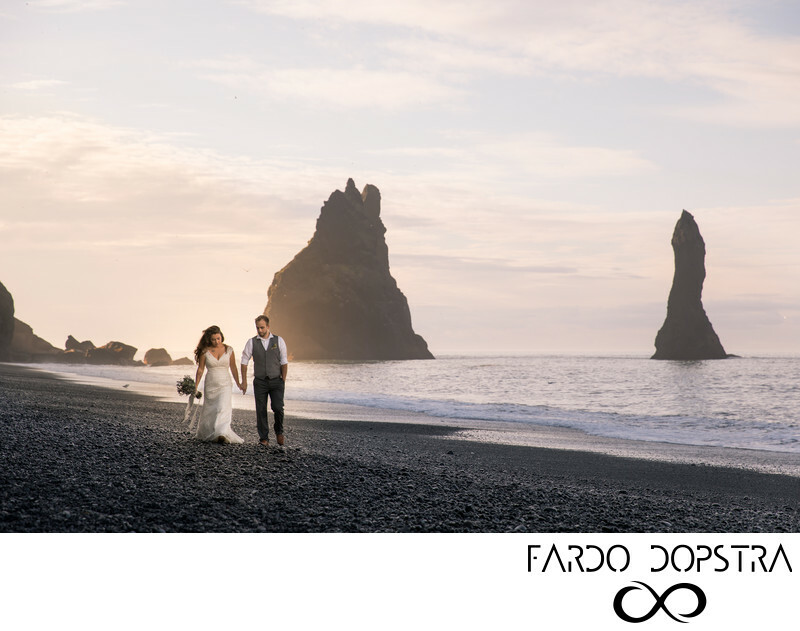 For Brayden and Lauren, Iceland was the fabulous backdrop to celebrate three years of marriage. They eloped to Paris to get married and a few years down the road they decided on an anniversary session at Vík black beach in Iceland. I am so glad Lauren found me online because Iceland Wedding Photography is my favourite! Long before the land of fire and ice was declared hot by cool young people, my mom already told me to visit Iceland. She travels all over the world and she knows things and I understood this was a time to listen to yo mama. So a few years ago I decided to make a stopover on a trip to New York to meet friends. In just three days, Iceland blew me a way (sometimes quite literally). I hardly slept and I took lots of photos. I knew I wanted to do wedding photography in Iceland one day. I've dne quite a bit of research and walking and driving around since then, and I've discovered ultra cool places for wedding photography. Lauren and Brayden had not been to Iceland before. But boy, did they enjoy it! We took their photos at the black beach of Vík. The black sand and pebbles (we only saw the pebbles because the tide was high) make it a great place but the hexagonal basalt stacks are truly special. The couple looked fabulous in a lace wedding dress and grey two piece with a crisp white shirt. The boutonniere and bouquet of flowers were brought all the way from Oregon. They had dried lavender in them, which made them quite pungent, and succulents. The clouds opened up to let us enjoy a bit of warm morning sun, which was a photographer’s dream. It reflected beautifully in the spray of the ocean, and that spray made it wrap right around the corner of the rocks. I imagine all of their days have a bit of this beauty in them. They tell each other every day why they chose each other. Now that is how you celebrate love!